J.K. Rowling, author, screenwriter and founder of international children’s organisation, Lumos, and Academy Award winning actor, Eddie Redmayne (a.k.a. Newt Scamander), opened a special advance screening of Warner Bros. Fantastic Beasts and Where to Find Them on Saturday 12th November on the Perelman Stage in Carnegie Hall’s Stern Auditorium. In front of nearly 3,000 guests, they discussed the work of Lumos in helping children around the world leave orphanages and institutions and return to family life. Jo went on to encourage people – and particularly young people – in the audience to get involved with the non-profit organisation’s work. She spoke of the urgent need to change minds, to do a little research, and support families to stay together. Eddie and Jo went on to talk about the new film, Fantastic Beasts and Where to Find Them. They were joined on stage by director David Yates and cast members Ezra Miller, Dan Fogler, Katherine Waterston and Alison Sudol, before introducing this special charity screening of the film. You can watch part of the conversation between Jo and Eddie here. 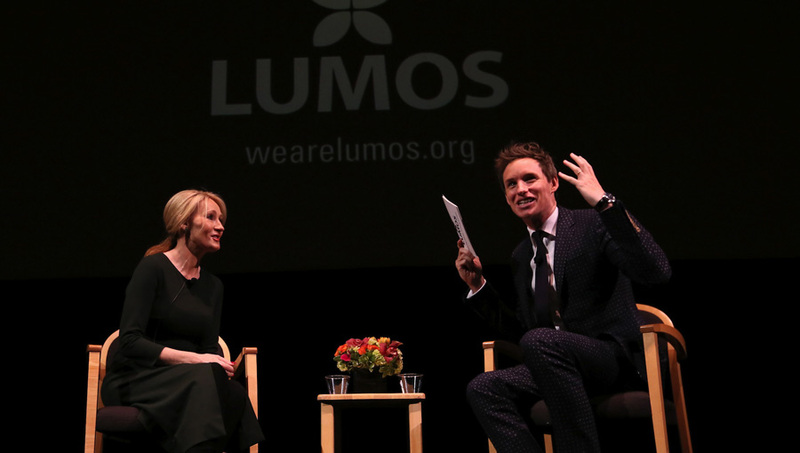 This event was part of We Are Lumos Worldwide, a global campaign to raise awareness of Lumos’ greatest goal: to bring to light the eight million children hidden away in orphanages around the world, and help them back into family homes. All proceeds, from both box office ticket sales and an online sweepstake, are going directly to support Lumos in its work. Fantastic Beasts and Where to Find Them went on general release six days later, on November 18th, in cinemas around the world.